The Freddy Krueger adult costume accessory kit from "Nightmare on Elm Street" can be used to create a quick and easy Freddy Krueger costume for Halloween or to give your friends a scare. 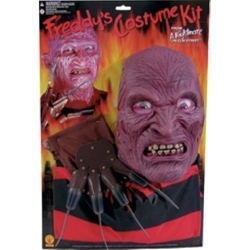 The Freddy Krueger adult costume accessory kit is colored as pictured. Kit includes Freddy Krueger mask, stripped shirt, and character glove. The shirt will fit up to a chest measurement of 42".